Potency: Q (Mother Tincture), 3x, 6x, 12x, 30x, 200, 1M or 1000. Want to see China benefits in Hindi or Urdu? Add our website to Google Translate to get the Hindi version. 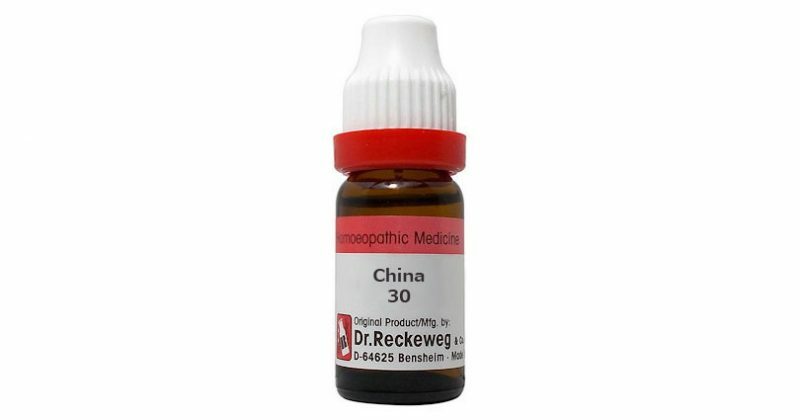 Introduction and History: China is a center of attraction or interest for homeopathic physicians. It is because it is the first medicine with which Dr. Hahnemann experimented and homeopathic science came into existence. The history and discovery of this medicine are remarkable. Countess ann, wife of the 4th count of Cinchona, was treated who was suffering from tertian fever by the use of this remedy in 1638. Its virtues were known to Europe in 1640. Dr. Hahnemann was studying the plant when he came up with the law of similars. That is why it is of particular interest to homeopaths. Preparation and Parts Used: The bark is employed in the making of mother tincture. Higher potencies are produced from the mother tincture. Habit and Habitat: It is a native of South America and is cultivated in India, Jamaica, Java and Sri Lanka. It is a slender tree which is 7 to 10 metres high. It is rough, brown, yellow with black and whitish markings on the bark. The bark is acquired from the branches, trunk and roots. It is the best choice for individuals with a ‘BROKEN DOWN’ constitution because of the loss of vital fluids and abuse of quinine, also from exhausting discharges. Face is sunken, pale, very thin, dry; patient has a billious constitution. The body, once robust, healthy, strong and stout, has now become weak and debilitated. Ailments From: Loss of vital fluids, bad effects of drinking tea, fruits, mental emotions, draught of air, tobacco, onanism, anger, alcohol, abuse of quinine and mercury, chill etc. Seat of Action (Pharmacodynamics): Blood, gastrointestinal tract, cardiovascular system, liver, circulation, brain, mind, nerves, spleen, mucous membranes, and respiratory system. Active Principles (Chemical Constituents): It consists of 25 alkaloids. Main are quinine, cinchonine, quinidine and cinchonidine. Works on the ganglionic nervous system causing a condition of general depression and exhaustion. It has a toxic effect on all protoplasm, specially active in preventing amoeboid movement. China also modifies the digestive functions. It inhibits enzyme action, thus slowing down the tissue metabolism. Works on the heart and circulation, destroying the oxygenation power of blood. The quantity and quality of blood is changed which produces a fall in blood pressure and starts hemorrhage. Blood gets thin and watery. Has a special understanding of the spleen and liver. It produces congestion, hyperaemia and causes jaundice. It reduces hyperpyrexia. China has the power to cause fever of several types, especially intermittent type of fever. Exalted fancy with slow flow of ideas. Selects wrong expressions. Cheerfulness alternating with sadness. Excessively anxious, solicited about unimportant thing. Apathetic, disobedient, great anxiety with despondency, taciturn, despondent. Person has no desire to live, but does not have courage to commit suicide. Delirium after closing eyes, sees figures of people. Ideas and projects crowd on his mind, especially in the evening causing sleeplessness. Person thinks himself unlucky and fancies he is opposed by everybody. Fear of dogs and other animals, especially at night time. Person lost in thoughts. Sudden crying and tossing about in despair. Person inclined to be angry and wanted to be quarrelsome. Fixed idea that he is unhappy, persecuted by enemies. Periodicity: Periodicity usually occurs in intermittent fever and neuralgia. Paroxysm for two to three hours, every attack comes back every seven or fourteen days, every three months, etc. Flatulence: Whole abdomen enormously distended, with a wish to belch. Belching provides no relief or gives only temporary relief. Fainting: Ringing in ears, general coldness, sometimes convulsions, fainting, loss of sight. Bleeding: From every outlet of the body. Blood usually is clotted and dark, oppressed breathing with a wish to be fanned. Oversensitiveness: Body of the patient is very sensitive to touch, lightest touch is intolerable to a diseased part; hard pressure relieves the pain of the same. Headache: Migraine as if the skull would burst, face flushed, intense throbbing of head and carotids, must stand or walk after hemorrhage or sexual excesses. Weakness: Great debility, aversion to exercise, sensitive to touch, trembling, weakness because of loss of vital fluids. Intermittent fever: Paroxysm of intermittent fever, every attack comes back every seven or fourteen days, anticipates it from two to three hours, Sweats only on the covered parts or during sleep. Pains: Drawing or tearing pains in every joint, all the bones; Soreness all over the body. Thirst: Thirst of this medicine is remarkably guiding in intermittent fever. Thirst before chill, thirst ceases as early as chill starts. Heat without thirst or thirst may start as chill is over. Great thirst while sweating. Draining: Headache, Insomnia, debility, neuralgia and other complaints resulting from loss of animal fluids, especially from seminal emissions, bleeding, nursing and Salivation. Diarrhea: Chronic diarrhea, without pain, debilitating with emaciation and aggravation at night. Emission of a large quantity of gas, at times, very fetid. Sleep: Sleep is unrefreshing or constant drowsiness, gets up early in the morning. Colic: Severe abdominal pain at a certain hour every day, periodical, from gall stones; gets worse at night and after eating, better bending double. Converse effects: Hunger and yet want of appetite, violent hunger, loathing. though the person is impotent along with sexual excitement; slight pressure or touch is unbearable, hard pressure gives relief. Aversions: Aversion to warm food, exercise, fatty things, meat and bread. Feeling: Person feels one hand icy cold and the other hand warm. Toothache: Teeth pain while nursing the child. Sweat: Perspiration day and night, as soon as one sleeps, during intermittent fever or after the overuse of quinine. Climacteric: After climacteric there is profuse hemorrhage; acute diseases often follow as dropsy with ringing and buzzing sound (Tinnitus) in the ears. Irritability: Great irritability and sensitivity of the entire nervous system. Desires: Craves for wine, coffee, cold things, highly seasoned food, sour things and sour fruits. Intermittent fever (malaria): China or Cinchona is a valuable medicine to cure the intermittent fever. It is prescribed in ague fever or malaria, that may be of the quotidian or tertian type, or the paroxysm may come back every week or fourteenth day. Periodicity is clearly defined in the fevers. The various stages of fever are clearly defined, that is, chill, heat and sweating. (i) Heat: This stage is long standing, generally without thirst. The patient wants to uncover with a fiery red face during delirium. Even if there is a great thirst, the person desires for water only to wet the mouth. During the fever the veins appear enlarged along with the congestion of the head. (ii) Chill: Chill comes usually in the forenoon. Chill of the whole body and of short-term span. Thirst occurs before and after but not during chill stage. Chill comes back every week. The person wants to remain near the fire. Chill with palpitation, hunger, anxiety, and at times headache; dry teasing cough during chill. The medicine may be said to be one of the thirstless medicines in fever. (iii) Sweat: This stage comes instantly after the fever stage. There is profuse sweat that makes the person weak; great thirst during sweat. Sweat does not provide any relief to the patient. There is marked restlessness, great hunger or loss of appetite, bodyache, splenomegaly and hepatomegaly with soreness, oedema, congestion and anemia, periodical return of symptoms. Apyrexia is marked with debility, scanty urine and brick dust sediment. Distension of abdomen: ‘Uncomfortable distension of abdomen, with a wish to burp, or sensation as though the abdomen were packed full, not relieved by belching.’ These patients feel so full and oppressive that they can scarcely breathe and still will feel appetite at meal time. There is fermentation. It seems as if all the food has become the gas in the abdomen. Bitter taste. Milk disagrees. There is loud rumbling and rolling in intestines. Flatulent colic, especially after eating and at night. Discharge of large quantities of gas. At times, there are griping pains. Offensive gas. Hemorrhages: Profuse with faintness, loss of sight and Tinnitus or ringing in the ears. Hemorrhage is from any orifice of the body. Blood has a tendency to be dark and clotted. Flow is so profuse as to have almost caused a bloodless condition. Coldness of the face and of the whole body is also present. Features show the presence of collapse, gasping for breath; desires to be fanned – because he believes that he gets more oxygen by fanning. Fanning is not for cooling purposes. Amelioration: Deep pressure, lying down, by bending double, while fasting, double, from warmth and open air. Aggravation: At night, wet weather, after eating, from slightest touch, draught of air, loss of vital fluids, every other day. Follows well: Arn, Ars, Carb-v, Lach, Merc, Ph-ac, Puls, Verat, Asaf, Bell, Calc-p, Sulph. Antidotes: Arn, Ars, Sep, Nux-v, Calc, Carb-v, Lach, Eup-per, Nat-m, Ferr, Ip, Merc, Puls, Rhus-t, Sulph, Verat. Dropsy, after haemorrhage; suppressed intermittents; abuse of quinine: Carb-v, Ferr, Chin. Bad effects from loss of blood: Ham, Chin. Flatulence in abdomen not relieved by belching: Lyc, Chin. Diarrhea from oysters: Lyc, Brom. Sweats day and night, as early as one sleeps or even when closing the eyes:Con, Chin. Dosage: Tincture to stop desire for alcohol. Sixth potency for jaundice and gall stone colic. High potencies work when low potencies fail in very acute conditions. Repetition: Repetition bears well when symptoms call for the medicine, otherwise, single dose is sufficient. Therapeutic Value: Abdominal disorders, Diarrhea, Alcoholism, Headache, Constipation, Amblyopia, Anemia, Catarrhal affections, Jaundice, Deafness, Dropsy, Dyspepsia, Gall stone colic, Hemorrhage, Hectic fever, Impotence, Intermittent fever, sleep disorder, Liver and spleen affections, Onanism, Pain, Respiratory troubles, Rheumatism, Suppuration, Vertigo. Note: China is a deep acting medicine and must be used only after consulting a competent doctor and self-medication should be avoided.